Grand Lake UMC is serving as a Relay Site for Operation Christmas Child the week of November 13-20, 2017. This is a call to begin packing shoeboxes with items such as toys, school supplies, hygiene items, t-shirts, socks, sunglasses, hair clips, etc. Ways to participate include filling and packing a shoebox, making a financial contribution to help distribute the boxes, welcoming those who drop off boxes or packing the boxes into shipping cartons. A sign-up for volunteers is located at the Connection Center of each campus. 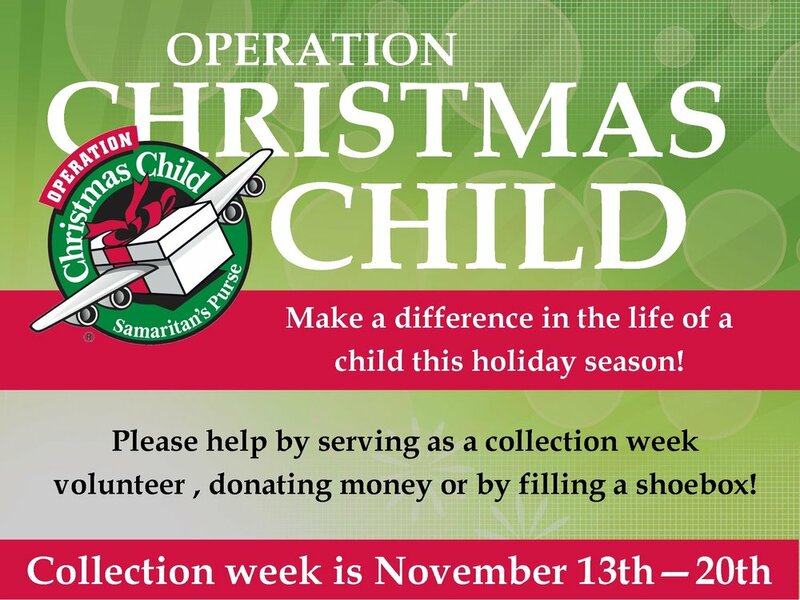 Shoebox collection times are Monday-Friday, November 13-17 from 5:30-7:30pm, Saturday, November 18 from 11:00am-1:00pm and Sunday, November 19, from 12:00-3:00pm. Contact Robyn Armstrong at 419-586-7044 if you have questions.